Had a great day in San Francisco yesterday. In the morning I walked around SoMa a bit and grabbed a breakfast of pancakes, eggs, and bacon. I stopped briefly at Sightglass coffee just to check it out and code offline a bit. Then I checked back in at home before heading out to meet Tess. I found Tess on OKCupid and arranged to explore the city a bit as she has just recently moved to the city. As we coordinated the meeting, I started to think maybe I had met her at Burning Man this past summer. It turns out that yes, she was in the Boston Burning Man community and spent some time at Automatic Subconscious. She was on crutches at that time and I remember her telling her story a bit. Heading to the burn on crutches is a pretty bold move. So we met at the Powell St BART station and started out on a long venture. We headed north and went through the chinatown gate and walked through chinatown. Yesterday was apparently the start of Chinese new year and folks were throwing snap fireworks onto the ground. I am always fascinated by the unfamiliar herbs and groceries they have packaged up in front of the stores. Then we wondered north along Montgomery and up some great stairs here and there, eventually hitting Coit Tower. Then down the Filbert Steps listening to parrots squaking. We went out to the Embarcadero and walked all along Fisherman's Warf. 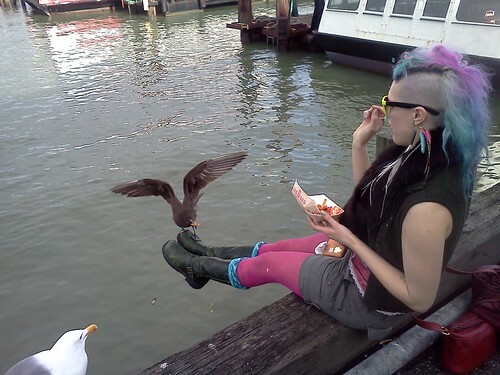 We stopped for some seafood lunch and Tess fed some seagulls off her feet. Then we hit Ghirardelli Square briefly and then walked south along Polk St all the way back past Market. We stopped in a bunch of book shops, thrift stores, and Paxton Gate when we switched over to Valencia and headed through the Mission. We had tapas at Esperpento and rested a bit after about 5.5 hours of walkabout. After dinner I walked another long walk to a bar called Bottom of the Hill for a pre-Node-Summit live NodeUp podcast and open bar party. I was quickly pretty exhausted so I walked north to SoMa and crashed into bed.